An output of only .6 GPM, so there is very little splashback while washing, compared to standard pressure washers that have an output of 3-4 GPM. 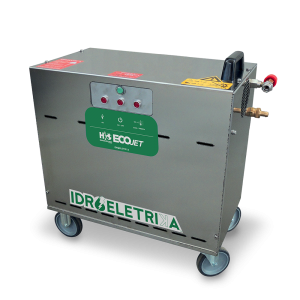 Thanks to its low-flow output, the IdroElectric provides precision cleaning of delicate parts commonly found in wineries/breweries without the risk of damage. 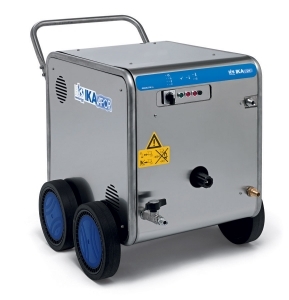 Boiler group power – water flow rate: 10 kW – 2.7 1/min max. 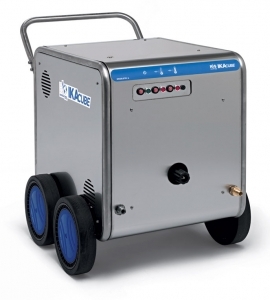 A unique, patented system that produces a constant, continuous high temperature and a powerful dispelling effect for cleaning and sanitizing equipment. Steam boiler for sterilizing bottling lines, micro-filter systems and for removing residues from stainless steel tanks. Eliminates Brettanomices from barrels. Reduced flow rates. Great for washing small parts, filters, valves and hard-to-reach areas.